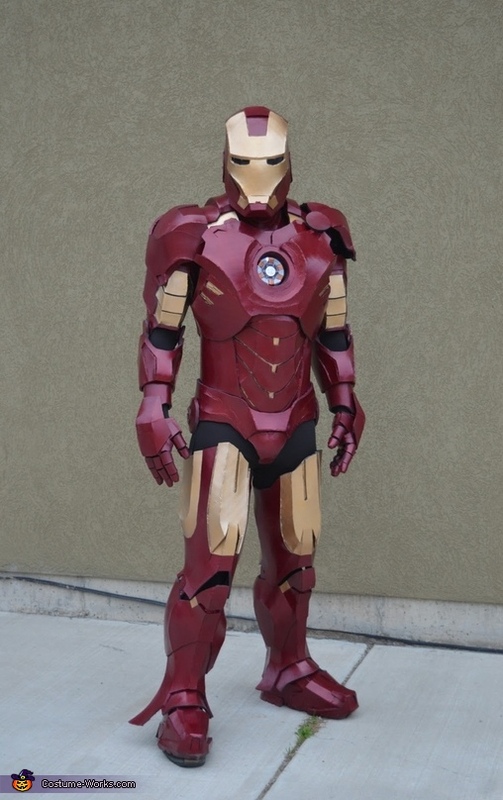 This is my Iron Man Mark 4 costume from the Iron Man 2 movie. Everything is 100% handmade by me, including the lighting system for the eyes, the hands and the chest piece. The hand lights can be turned on by simply raising my hands up like I’m shooting something. The suit is made with EVA foam and hot glue. Then spray painted with auto body paint. I have always loved Iron Man. I am inspired by how he doesn’t have super powers yet can still be a super hero. Back when I was a kid I attempted to make an iron man suit out of cardboard. This was a few years before the first movie was released. Everyone thought I was a power ranger because hardly anyone new who Iron Man was since it wasn’t a movie. I have been working on this costume for 14 months, starting last September and finally finishing this Monday (10-26-2015). I have actually never made a costume like this before, so this is my first time doing something this intense. -Use materials you already have to cut down the cost. For example: My glowing chest piece is actually just the bottom of a Gatorade bottle with speaker wire and electric tape). -Make sure you coat the foam with something before painting because it acts as a sponge and will just soak up the pain. I used Plasti-dip on my suit. It was a blast making this, very time consuming but fun, and the results are phenomenal! Hope you enjoy it like I do! is it for sale, and if so how much? [at]Raheem. Nope. Sorry not for sale. But even if it was, and I priced it to cover all the hours put into it, it would have to be over $3000 at only $10/hour and that isn't even including the cost of all the materials. Haha. You should make one though, it was a blast doing it!